Posted by Candie Kates on Feb. 9, 2017 11:20:07. Transferring a huge number of text messages from one Android device to another is often an important need. However, the good news is that SMS transfer has now become an easy task with the release of innovative software. You may easily move all your text messages from your old Android handset to a new one in a few minutes. You may be able to keep your entire significant content safe in your new model. Whether it is a voice message or text message, the software allows you to transfer it easily without affecting the original content. So, to transfer messages from one Android device to another Android phone, you have to use TunesBro Phone Transfer. The software enables you in copying your messages from old Android mobile and storing them to a different Android device. This is possible only with few clicks. 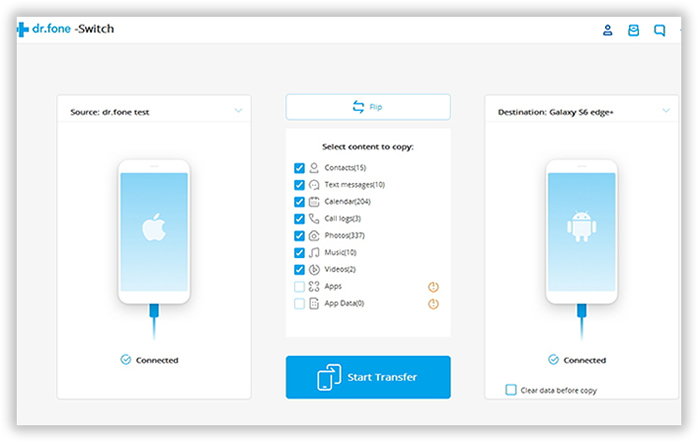 However, PhoneTrans helps to transfer not only SMS but also other files, like contacts, videos and music. The app may take only five to ten minutes for completing the work. You will have no risk of damaging the original SMS. Support Devices: Samsung Galaxy S8/S7/Note 8, HTC U11/M10, LG G6/G5, Sony, Moto, OnePlus 5/3T, Lenovo, Xiaomi, iPhone 8/ 7/6S/6/5S and other 2000+ phone model. It is the first step, where you need to download and install the program on a computer. Then launch it on that computer. After doing this step, you will see the appearance of the program. Connect your old and new Android phones to your computer by using USB cables. Just after you have developed the connection, PhoneTrans app will be able to detect the devices automatically. Two mobiles will then be displayed on two separate places. One of them is Source phone, while the other one is Destination phone. However, when you like to alter the position of your two mobiles, you may hit Flip option at the central position of the interface. At this stage, all your files can be exported to a new handset with Android operating system. So, when you like to move just text messages, you need to erase the tick marks for other items, which are checked in default. While this step is done, click Start Copy button. All the messages on the source phone will be transferred to destination phone in less than 10 minutes. At the time of transferring process, you have to ensure the connections of both Android mobile are well kept. While this procedure is completed, you need to hit OK to end the process. With these few easy steps, you can transfer your SMS from one Android to another Android phone. 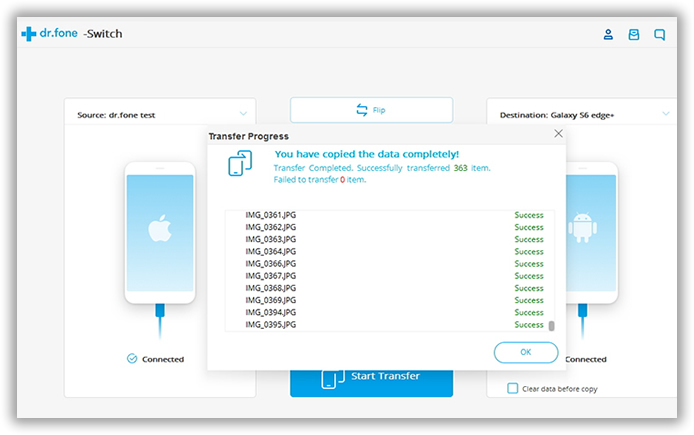 By far, PhoneTrans is the best software for data transfer between two smartphones, including iPhone, Android, Blackberry and Windows Mobile. However, if you just want to transfer SMS from Android to Android, then there is an alternative option, called Apolsoft Android SMS Transfer for doing the same thing. This app has been designed for all Android mobiles, and it helps you in moving and backing up all the messages between two Android phones. You may also edit or view all those exported messages. The steps for Android SMS transfer with the help of Android SMS Transfer are stated below. You have to download the app on your two devices, and then after installing the software, you have to ensure that the program can be run properly. Choose Apolsoft Android SMS Transfer in mobile devices, and run it. 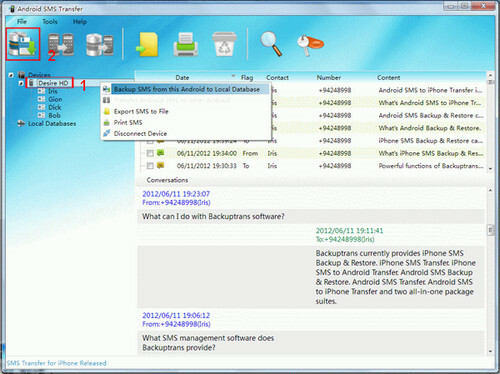 On the major interface, you may find the option- Backup SMS. With this option, you may begin the process of backing up any SMS. After the completion of backup process, all messages may be backed up or save to your SD card. When you have no such card, you can have the messages in ROM of the device. You can transfer the file to another android phone using Bluetooth or using your system. 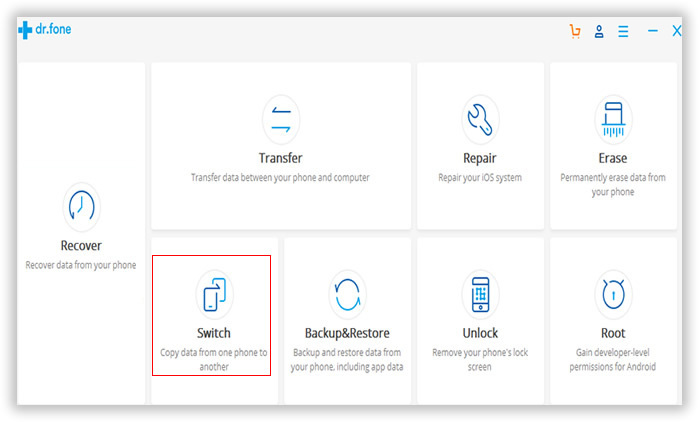 Now that you have transferred the backup file, you can launch the same application on the phone and select the restore option on the user interface. Then you'll have to select the respected file for the restoration from your phone library. You'll now be able to see all the messages in the message box. For Android SMS transfer, you are free to use any of the two methods described above. However, after two months usage, PhoneTrans is a better choice for data transfer between two smartphones as it supports more devices and data types. With this app, you can copy data from one phone to another no matter which device you would buy next. On the contrary, Apolsoft only supports Android based smartphones.